The Spiral and the Square. Exercises in translatability. “The Spiral and the Square” is one exhibition, curated by Daniela Castro and Jochen Volz, which is part of a larger project initiated so as to approach the issues of translation and translatability of other places from a primarily Swedish perspective—beginning with a close-up on Brazilian culture. Only one of many cultures which continue to infiltrate Sweden bringing up issues of nationality, tolerance, collaboration and compromise, shows like this one are increasingly important to those who question ways in which identities are formed, molded and maintained, as well as to those who find themselves relating to both positions of the insider and outsider. The exercise of focusing on one culture is a starting point for a number of conversations that presently exist and continue to in order to keep creative liberties in check. There are moments when specific cultures genuinely intermingle, and in contrast: there are other moments where cultures find themselves at odds with one another despite attempts to harmoniously coalesce. To continue to locate creative modes to function side by side, despite previous failures or setbacks, remains a priority. This exhibition series is a collaboration between Bonniers Konsthall, Södertörn University and Albert Bonniers Company and hopes to bring focus to regions of the world that are not so “well-known” to Sweden—so one can safely assume, other European countries and the United States will not be part of the series' future schematics. The works presented are neither organized in a generational nor geographical way. 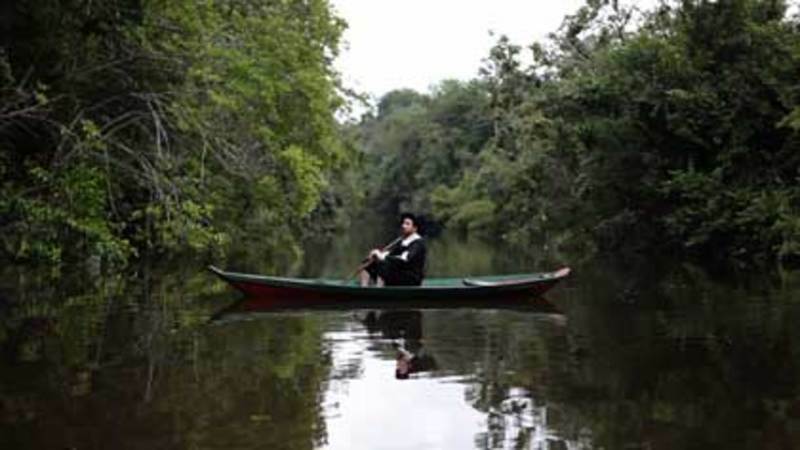 The exhibition includes both Brazilian artists and international artists currently working in Brazil—the motivation for this exhibition stems primarily from a curiosity about the Brazilian art scene without intending for this show to be coined as a “Brazilian art show.” Included works waver between the already existing and newly commissioned. The title of the exhibition is inspired by a palindrome's role in Brazilian author Osman Lins' novel Avalovara, 1973; the novel itself tricks its reader into maze-like narratives based upon deliberate repetition and condensing phrases which unleash a circular effect. The works present in the exhibition vary in medium and method, with a conjoining thread of communication and contact. Yet, problems of translatability should not only be considered in the more obvious language-oriented way. Such concerns also apply to those who have no obvious language barrier—moving between mediums, forms and designs, between age differences, traditions, between experiences and personal sentiments where one is no suitable replacement for another. Any chosen interpretation can be limiting and liberating—simultaneously. This exhibition is influenced by various literary figures, such as the Brazilian concrete poet Haroldo de Campos and Martiniquan writer Édouard Glissant. “The Spiral and the Square” does not consist of only the stationary exhibition but other peripheral events: film viewings, concerts and performances meant to ignite the community, to socially engage in how these translation issues affect everyone—no matter what creative approach is adopted. A point of this exhibition is to remind the viewer that translation is the responsibility of the one interacting with a particular work; one must try in the best way they can to understand what is provided, and this task requires many angles, flexibility and an inquisitive stance. Being a former colony, Brazil embodies the metaphor of moving between and amongst the square and the spiral; this power dynamic applies when a more powerful country infiltrates another of less power. History shows that when most countries are colonized through force and brutish usurpation, it is rarely calmly accepted. The transformation of one culture into another is also reflected in the artistic movements of the time in question. Instead of choosing artworks which stand to highlight translation, the exhibition intends to be more of “an exercise of translatability”—much like Lins' novel which provided the reader with one narrative movement morphing into another, with eight different parts to be translated from one state into another. “The Spiral and the Square” is also a title for one of Lins' narratives. The movement between the spiral and the square is complex, since one of these objects is defined and linear, whereas the other stands to be infinite and, at times, unfathomable. In a world where both the stringent and flexible exist, it is important to understand this dichotomy so as to overcome its influence and one's position on the spectrum between these forces. Laura Lima, Marra, 1996-2011. Foto: Olle Kirchmeier. Courtesy the artist and Bonniers Konsthall. A rich exhibition, “The Spiral and the Square” provides examples of what it means for any artist to work in-and-among genres by using language as a starting point for further expansion, providing contrasting readings of materials and situations which can seem blocked or cornered by oversimplification. Highlights are: Laura Lima's Marra,1996, which is part of a series of performances where actors follow through with specific actions using objects—often repetitive—restraining and intending to alter participants' viewpoints by exploring limits of the human body and exploding gestural nuance; Arto Lindsay's music performance (at the opening) exposing his interest in the Tropicália Movement and experimentations using pop, samba and bossa nova; Dominique Gonzalez-Foerster's Textorama, 2009 which is a calligrammatic wall of excerpts and quotations from famous and unknown works which influence her practice; and Cao Guimarães' feature film Ex Isto, 2010 inspired by Paulo Leminski's novel Catatau, 1975, which follows the philosopher René Descartes on a supposed journey (somewhat exotic and strange) with Maurice of Nassau to Brazil in the seventeenth century. Other works by Eugenio Dittborn, Renata Lucas and Öyvind Fahlström—alongside others—give the interested observer various angles to explore, with the assumption of an open mind and authentic cultural exchange. Top Image: Cao Guimarães, Ex Isto, 2010. Courtesy the artist and Bonniers Konsthall.